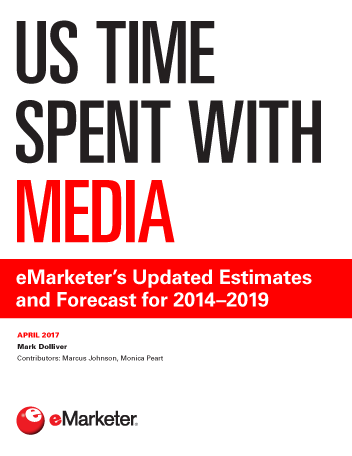 eMarketer estimates that US adults will average 12 hours 7 minutes of media usage per day this year, up 3 minutes from 2016. Time spent with mobile will account for nearly all of the increase. Thanks to multitasking, time spent with media surged in tandem with adoption of mobile devices. With gains in mobile penetration now modest, though, gains in time spent have also slowed. Total time spent with major media is expected to be just 0.3% higher this year than last. Digital usage will reach 5 hours 50 minutes per day in 2017. The figure is still rising, though decreases in desktop/laptop time partly offset gains in mobile. Nonvoice mobile usage is expected to average 3 hours 14 minutes daily; desktop/laptop internet usage is expected to average 2 hours 8 minutes. Nondigital TV still accounts for the biggest single chunk of adults’ media time, but its share slowly dwindles each year. Among millennials, time spent is declining sharply. Time spent with digital video keeps rising and is expected to average 1 hour 13 minutes per day this year. Time spent with smartphones and tablets increasingly skews toward apps rather than the mobile web. In-app usage is expected to account for 89.2% of smartphone time and 76.8% of tablet time in 2017. The migration of social networking to mobile devices continues apace. Mobile time with social—the bulk of it via smartphone—will be more than double desktop/laptop time this year, 33 minutes to 13 minutes. After lagging greatly in earlier years, digital’s share of ad spending is now much closer to its share of adults’ time spent—an estimated 42.4% vs. 49.6% this year. And share of ad spending on mobile will exceed share of time spent there, at 29.4% vs. 27.5%. "Nondigital TV remains the biggest single element of US adults’ daily media usage. On the digital side, mobile usage is steadily displacing desktop/laptop usage, though mobile growth itself is slowing."